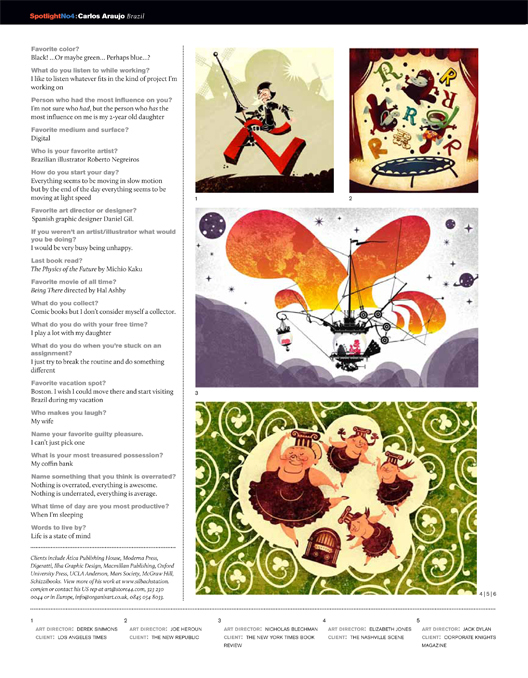 Illustrator Carlos Araujo is featured in 3x3 Magazine 21. Carlos Araujo is a whimsical illustrator currently based out of Brazil. With a background in several mediums including 8+ years in graphic design, his passion is in illustrations. His work can be seen in books, magazines, posters, and gallery shows appearing worldwide. FOR IMMEDIATE RELEASE [New York]—The work by Carlos Araujo was chosen as one of six international illustrators to be featured in the most recent 3x3 Magazine. 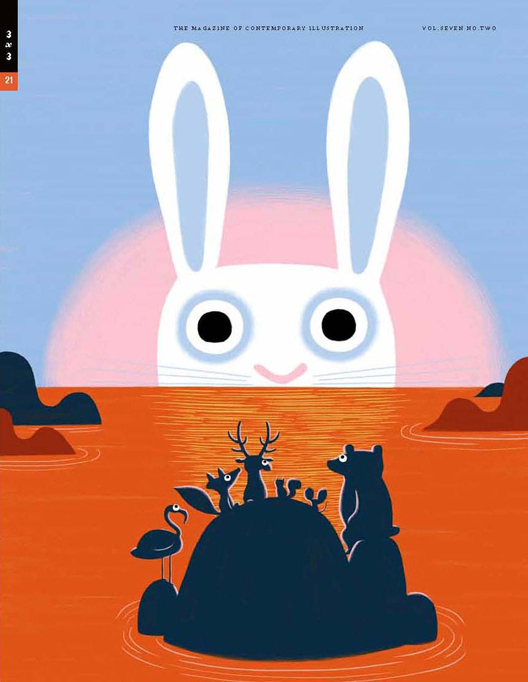 Only six illustrators are selected for each issue, the theme of this issue was whimsical illustration and we found Carlos to be one of the most talented illustrators working in the field today. Now in our 10th year we recognize outstanding creative work produced by individuals from around the world and feature those individuals in our special section called Spotlight. 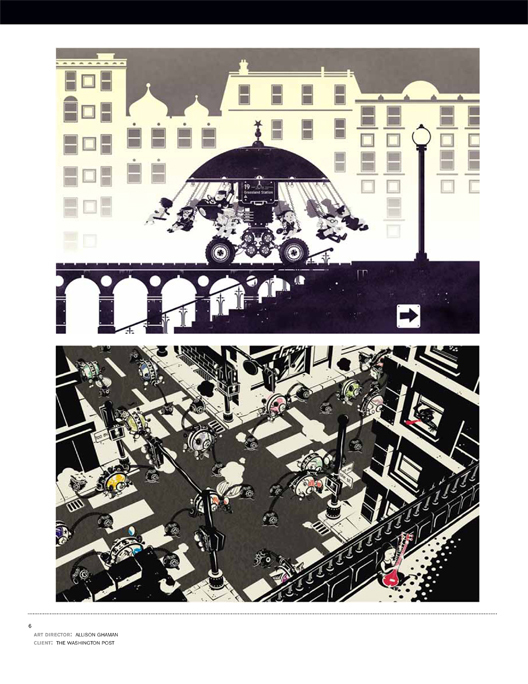 As a curated section of the magazine Spotlight includes a brief biography of the illustrator, examples of work and asks a series of questions about the artist and their working methods as well as covering influences which make their work unique. Playful and cute ballerinas performing the “Ballet of Bodijas”. Made for a series of Educational Books. In defense of the Spanish tradition: Don Quixote riding the very spanish letter Ñ.
Carlos’s works are featured in the October 2012 issue of 3x3 magazine available at leading newsstands and bookstores worldwide. 3x3 is the first magazine devoted entirely to the art of contemporary illustration. Published in the United States and distributed worldwide, we are interested in what’s shaping international illustration. Our Mission. : To preserve, protect and promote illustration in all its forms. First we want to preserve today’s illustration by producing printed forms of communication to enable future generations to get a glance at what illustrators were doing during this time period. In this digital age it is too easy to lose track of an individual’s work, to search through past archives looking for information about an artist or project is time-consuming. With 3x3 the information is on your bookshelf, letting you update your knowledge of a particular artist on the web. The two work hand-in-hand to provide a record of achievement. Secondly we want to protect the legacy of the top illustrators in the field. Our interest is in helping the best illustrators advance their careers and to that end we offer podcasts, conferences and affordable books to help the next generation of illustrators learn from the experiences of the current generation.